The effects of the exclusion on the federal budget are large, exceeding federal spending on Medicaid. The Joint Committee on Taxation has estimated that the total federal tax expenditure associated with the exclusion for employment-based health insurance was $246 billion in 2007, consisting of $145 billion in individual income taxes and $101 billion in payroll taxes. 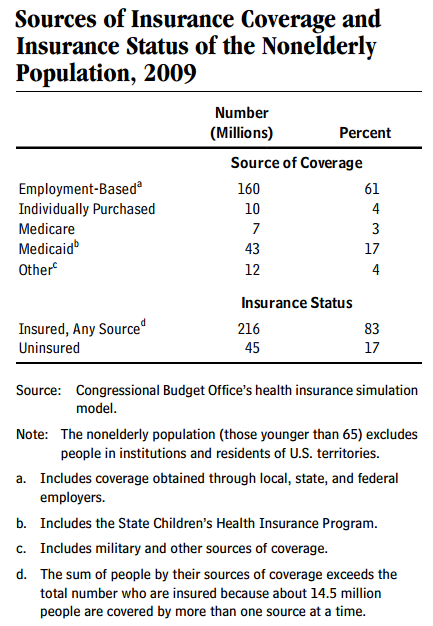 By comparison, the federal government spent over $195 billion on Medicaid in 2007. In addition, the federal government incurs an additional tax expenditure of about $5 billion annually by allowing self-employed individuals to deduct the costs of health insurance from their taxable income. During World War II, workers demanded wage increases that were prohibited by wartime wage and price controls. To grant a concession to labor without violating wage and price controls, Congress exempted employer-sponsored health insurance from wage controls and income taxation—in effect allowing off-the-books raises for employees in the form of non-taxable health benefits. This created an enormous tax advantage for employer-sponsored health benefits over health insurance purchased by employees with after-tax dollars (e.g., auto insurance). By the mid-1960s employer paid health benefits were almost universal. Individuals with the same income and similar family responsibilities can receive very different tax benefits for medical costs. Employees who can exclude premiums for employment-based insurance from payroll taxation, as well as from individual income taxes, typically receive more generous tax subsidies than do self employed individuals. Employees who work for firms that do not offer insurance do not benefit from the exclusion. Should We Eliminate the Tax Exclusion for Employer Paid Health Insurance? Some economists think that reducing or eliminating the tax exclusion would slow spending on health care because it would prompt employers to choose less generous insurance plans that cost less. However, eliminating the tax exclusion would eliminate the primary reason most employers offer health insurance, which might cause many firms to drop health insurance coverage altogether. Starting in 2018, the Affordable Care Act (ACA) attempts to address this issue by imposing a 40 percent excise tax on health plans that cost more than $10,200 for individuals, or more than $27,500 for a family. What do you think? Should we remove the tax exclusion for employer paid health insurance?